The word Pirate brings to mind buried treasure, walking the plank, parrots, cutlasses, black eye patches, wooden legs, pieces of eight, and jolly Roger flags. How close are these images, though, to the real world of pirates? Who were these men and how did they live their lives? Piracy is as old as the history of sailing itself. Some of the earliest pirates were the Phoenicians who plied the Mediterranean from about 2000 B.C.. While the Phoenicians conducted much legitimate trade, they also didn't flinch from attacking other merchant ships or even coastal towns. Later, around 150 B.C. the Cilician pirates from Turkey took control of the Mediterranean until 67 B.C. when the Roman senate ordered Pompey, a brilliant Roman general, to hunt them down. He was successful in clearing the sea of them within three months. Pirates appeared in great number on the Mediterranean again during the Middle Ages. While on land, crusades were conducted by Christian Europeans to get control of the "Holy Land" of the Middle East, held by Muslims, pirates conducted similar battles on the Sea. These pirates, known as the Corsairs, were skilled Muslim and Christian seamen who attacked ships owned by those of the opposing religion. The booty they gained was often the crew and passengers of the ships as well as the cargo. Men and women were sold as slaves or, in the case of those from rich families, ransomed for cash. The pirates we are most familiar with, though, are those from a time that might be called The Golden Age of Piracy. This period started soon after the discovery of the New World and continued for about 250 years. In 1494 the Pope divided the New World between Spain and Portugal. Predictably this did not sit well with the other European nations. They wanted a part of the gold the Spanish were stealing from the Aztecs of South America and conflict was inevitable. 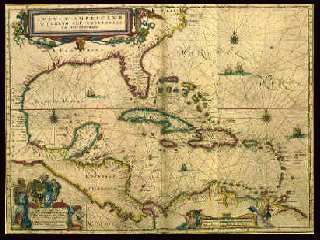 The part of the New World coast from South America through the Caribbean to Northern Florida was known as "The Spanish Main" (right). It was from ports along these coasts that Spanish galleons, large treasure ships, sailed for Europe. The European powers began attacking these ships and taking the gold for themselves. Outfitting ships was expensive and one way to raise a fleet at little cost was to issue "letters of marque" that entitled the owner of a private ship to outfit it for war and use it to attack enemy ships. In return for official permission the ship's owner split any booty captured with the royal treasury. Men who engaged in this activity were referred to as "privateers." Privateers were in effect legal pirates. Or at least legal to those governments with which they shared the loot. Sir Francis Drake, who started his career in 1570, was a hated pirate to Spain, but a hero in England where Queen Elizabeth addressed him as "my dear pirate." His popularity with the crown was assured after one expedition where he captured for treasury 300,000 pounds of booty, keeping another 10,000 for himself. Drake not only raided ships, but attacked Spanish towns and mule trains carrying gold. So favored was Drake by the Queen that she presented him with a special sword to use upon her enemies. There was a danger in using privateers, though. Often these independent captains were tempted to attack ships of countries besides those their nation was at war against. Also in times of peace it left thousands of men jobless who had been trained to attack ships and seize goods. The temptation to turn pirate during these times was immense and many men did so. In 1630 a treaty was signed with Spain that allowed the English and French to colonize some of the lands along the Spanish Main. Many of the European settlers wound up on the island of Hispaniola (now Haiti and the Dominican Republic). One of the main sources of food on the island was wild pigs originally introduced by the Spanish. The settlers barbecued the pigs on open fires called buccans or boucan. From this the settlers eventually got the title buccaneers. The Spanish became nervous over the many buccaneers on Hispaniola and sent hunters to slaughter the pigs. This backfired as the buccaneers, with their food supply gone, turned to piracy to meet their needs. Many of the buccaneers, who also referred to themselves as the "Brethren of the Coast," moved to the island of Tortuga, off the coast of Hispaniola and it became a pirate stronghold. Its fresh water, fertile ground, good anchorages and defensible harbors made it ideal for their needs. The buccaneers often used small boats called pinnaces for their attacks. Using these they could sneak up on unsuspecting merchant ships and get control of the ship even before the crew knew they were under attack. When they used larger ships the pirates often favored smaller, single-masted sloops that could operate in shallow water. This allowed the ships to be easily hidden in small hidden bays and inlets. The English buccaneers liked attacking with the dozen or so cannon on deck, while French pirates preferred hand-to-hand combat with small arms and knives. While some pirates were excessively cruel outlaws, many were just plain sailors who could not find an honest living. The life of a sailor in those times was hard. The power of the captain of a merchant ship or a military vessel was nearly absolute. Crewmen could be whipped by a cruel captain for the least offense. In contrast many pirate ships were run democratically. Before a voyage the crew held a council that included all the members. As a group they decided where to sail, who should be captain, and how any booty should be divided up. The captain usually got a double share and crew members with special skills, such as a doctor or carpenter got one and one half. The council also drew up a list of rules that all the crew agreed to obey. Probably the most famous of the buccaneers was Sir Henry Morgan. Morgan was born in Wales in 1635. In his teens he joined a pirate crew from Tortuga and swore an oath as a member of the "Brethren of the Coast." After a successful trip, Morgan and some friends decided to outfit their own ship. Morgan was elected captain and his first raid was a great success. Many more followed. Morgan became a vice admiral in the buccaneer fleet and quickly became very famous and rich. In 1668 the governor of the island of Jamaica got wind of Spanish plans to attack the island. He offered Morgan a letter of marque making him a legal privateer if Morgan would attack the Spanish first and share any spoils with the governor. Morgan agreed and the campaign was a success, though Morgan had a close escape. While raiding the city of Maracaibo in Venezuela, Morgan's ships were trapped in the harbor by Spanish vessels. Morgan had his crew clean out a captured merchant ship and fill it with pitch, tar and gunpowder: an explosive combination. Fake cannons made out of Indian drums and dummies of the crew (with pumpkins for heads) were placed on deck. A handful of men then steered the ship toward the Spanish forces, lit fuses attached to the gunpowder kegs, and escaped in small boats. The Spanish ships engaged the vessel. The ship blew up at close range sinking two of attackers. Then Morgan attacked the remaining Spanish vessels. The battle raged for days, but Morgan's forces escaped. Later, Morgan settled down on a plantation he'd purchased in Jamaica. King Charles II knighted him and he later became Deputy Governor of Jamaica. He died in 1688 a contented man. Few pirates enjoyed a retirement like Morgan's. Some were caught, tried and hung for their misdeeds and their bodies were often left to rot hanging about the dock as a warning to other sailors. Many more, though, died of disease or alcoholism. Many ports welcomed pirates because of the wealth they had to spend. Port Royal, Jamaica, became a leading buccaneer base after it was captured by the British from the Spanish in 1655. So much plundered gold and silver was flowing into the city by 1662 the government established a mint there. Brothels, gambling houses and bars quickly sprang up to satisfy the needs of the buccaneers. In July 1661 alone, forty new licenses were granted for taverns in the city. So wild was the situation in the port a minister arriving to meet spiritual needs there immediately departed on the same ship declaring that "since the majority of its population consists of pirates, cutthroats, whores and some of the vilest persons in the whole of the world, I felt my permanence there was of no use." 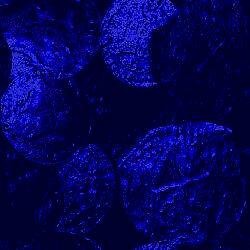 This pirate heaven wouldn't last forever and by 1700 buccaneering was almost gone in the Caribbean. The amount of treasure being shipped back by Spain from the New World dwindled, so there were fewer ships to attack. Nations started to depend less on privateers and more on full-time navies. Piracy wasn't completely banished from the New World's coast, though. In 1713 the Treaty of Utrecht brought an end to the War of Spanish Succession. Suddenly there were thousands of seamen unleashed from military service and few jobs. Many went to sea again as pirates. It is from this period that some of the most famous pirate captains emerged: Captain Kidd, Black Bart Roberts, Calico Jack and, of course, Blackbeard. While Blackbeard had perhaps the worst reputation, he was not the cruelest pirate of his era. That title belonged to Captain Edward Low, a psychopathic pirate who enjoyed torturing his captives to get them to reveal hidden valuables. Blackbeard was the best, though, at self promotion. Having a terrifying reputation was important for a pirate. The more fear he struck into the crew of a ship, the more likely they would surrender without a fight. Blackbeard (left) was a big man, with a naturally scowling face, long, thick black hair and beard, and wild, deep-set eyes. To further heighten his terrifying presence, Blackbeard would go into battle with lighted tapers in his hair. These belched black smoke, making Blackbeard appear to his enemies as some kind of demon. Blackbeard, whose real name is thought to be Edward Teach, began his career as a privateer, but after the Treaty of Utrecht joined the crew of a pirate ship. He soon had his own ship called Queen Anne's Revenge. In May of 1718, Blackbeard was bold enough to blockade the harbor of Charleston, South Carolina, using the Queen Anne's Revenge and two smaller vessels, and demand ransom. He got it. He also got a pardon from the North Carolina governor, Charles Eden, in return for a cut of his booty. The pardon didn't prevent Blackbeard from harassing plantation owners along the Pamlico River, though. The plantation owners appealed for help from Governor Spotwood of Virginia. Spotwood, a pirate foe, spent his own money to finance an expedition to Ocracoke Inlet, North Carolina, to put an end to Blackbeard. Lieutenant Robert Maynard, of the British Navy, with sixty-two men attacked the pirates there using two small ships. Despite only having eighteen men with him, Blackbeard nearly won the engagement. 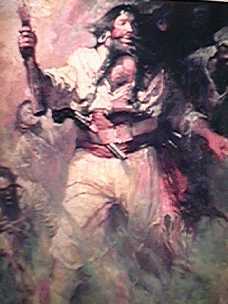 Blackbeard fought like a cornered beast and took 20 cutlass wounds and five pistol shots before he died. When he was dead his head was removed and hung from Maynard ship's bowsprit as proof of his death. The British Navy continued to hunt down pirates in the Caribbean and along North American coasts. Harsh laws were enacted to punish those who bought or sold to pirates. These measures, along with rules forbidding cruel punishments on Navy vessels, brought the Golden Age of Piracy to an end. Piracy continued in the Indian Ocean for a while, and some of it even exists today in Southeast Asia. What makes the pirates of the golden age stick in our minds? The answer is literature. Not everything we read in fictional accounts are accurate, though. 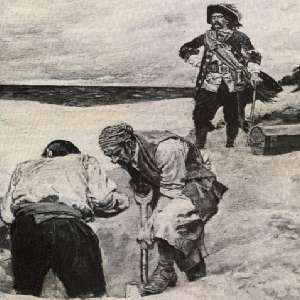 Few pirates ever made prisoners walk the plank, and only one pirate that we know of, Captain Kidd, ever buried a treasure (though pirates are associated with the mystery of Oak Island pit in Nova Scotia). Books like Treasure Island by Robert Louis Stevenson, published in 1883, and later J.M. Barries' play Peter Pan, first performed in 1904, featured colorful pirates from this age giving them an aura of glamour and romance. Movies later continued this tradition, forever fixing in our minds these rogues, and this era.